Hillary Clinton has secured a majority of delegates to the Democratic National Convention, NBC News projected on Monday evening — making the former secretary of state the presumptive nominee of the Democratic Party. Clinton, whose first quest for the Democratic nomination ended in a concession speech almost exactly eight years ago to the day, now becomes the first woman ever to win the nomination of a major political party in the United States. 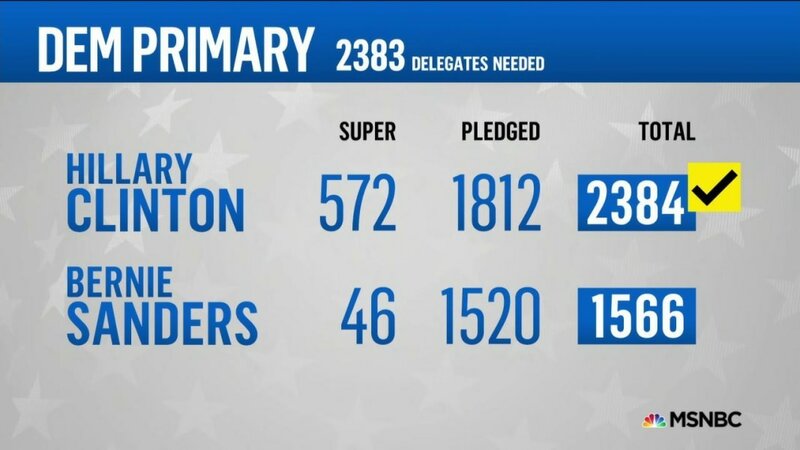 Clinton reached the majority of 2,383 delegates with a combination of pledged and unpledged "super delegates." The new tally includes pledges from over a dozen new superdelegates as well as her accumulation of 36 pledged delegates in Sunday's Puerto Rico primary. By NBC's count, Clinton now has 1812 pledged delegates and 572 superdelegates, while Sanders has 1520 pledged and 46 superdelegates. Clinton was widely expected to reach the 2,383 threshold on Tuesday, when six states hold their nominating contests on one of the final primary nights of the race. 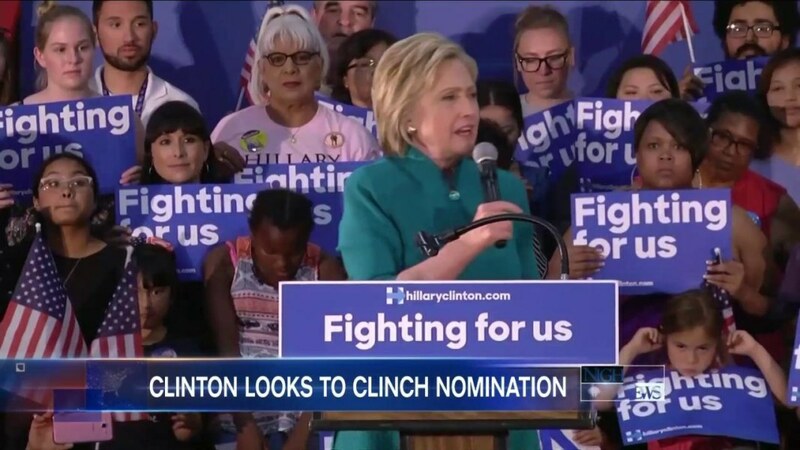 In a statement, Hillary Clinton campaign manager Robby Mook nodded to the upcoming contests in an attempt to mute an announcement the campaign would have preferred to come after voters headed to the polls in those primaries. "This is an important milestone, but there are six states that are voting Tuesday, with millions of people heading to the polls, and Hillary Clinton is working to earn every vote," Mook said. "We look forward to Tuesday night, when Hillary Clinton will clinch not only a win in the popular vote, but also the majority of pledged delegates." 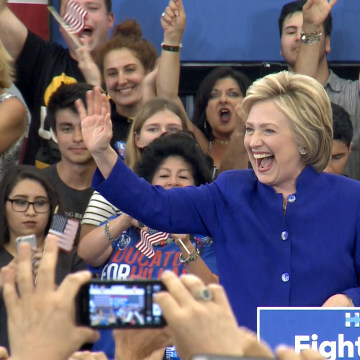 Clinton's campaign worked to reiterate that message in a tweet. 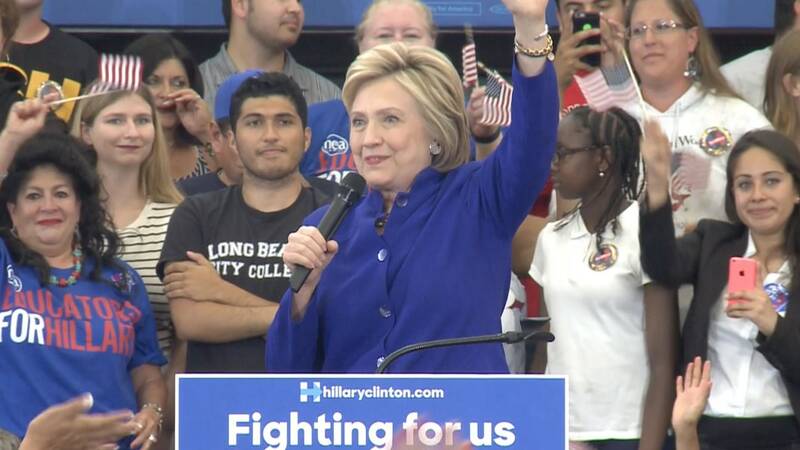 And the candidate herself, speaking in Long Beach, California, noted that the campaign is not over yet. "According to the news, we are on the brink of a historic, historic, unprecedented moment but we still have work to do don’t we?" she said. "We have six elections tomorrow and we are going to fight hard for every single vote especially right here in California!" To win the nomination, a candidate must secure a majority of all delegates, or 2,383. But 15 percent of the total delegate pool is made up of superdelegates — current and former elected officials and party activists who aren't bound to vote for the candidate selected by voters in their home state's primary. Clinton rival Bernie Sanders has long protested that the superdelegate system fails to reflect the will of the voters. He has argued that superdelegates can switch their votes at any time before the Democratic National Convention in July. In a statement Tuesday night, Sanders spokesman Michael Briggs reiterated that message, blaming the media's "rush to judgment" for the decision. "Secretary Clinton does not have and will not have the requisite number of pledged delegates to secure the nomination. 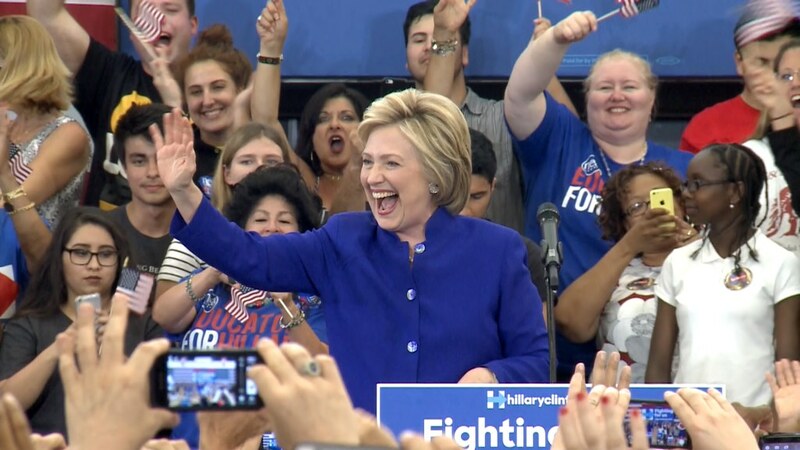 She will be dependent on superdelegates who do not vote until July 25 and who can change their minds between now and then," he wrote. “Our job from now until the convention is to convince those superdelegates that Bernie is by far the strongest candidate against Donald Trump," he added. While Sanders is correct that superdelegates can switch their votes, there is no precedent for a huge number of superdelegates' switching sides. In the 2008 Democratic race, when superdelegates made up 20 percent of the delegate pool, no more than about 30 switched their support from Clinton to Barack Obama. What's more, Obama then led among pledged delegates even when superdelegates weren't included in the total count. Sanders, on the other hands, trails Clinton significantly among pledged delegates, as well as in the total delegate count. Sanders' continued objections to party rules presents a maddening problem for Clinton, who has already sought to focus her energies on the general election matchup against Donald Trump. But while Trump has largely been able to unite the Republican Party despite major ideological rifts with party leaders, Clinton risks alienating Sanders and his supporters by dismissing a campaign that far exceeded its quixotic beginning in fundraising and voter enthusiasm. What's more, Sanders hopes to notch a victory in Tuesday's California primary, in which polls have shown the candidates in a dead heat. Despite urging from party elders that Sanders exit the race, a win in the large and diverse state would bolster his case to remain a candidate until the convention in hope of influencing the party's platform, swaying superdelegates and even contesting Clinton's nomination on the floor.